The Verbier High Five is a skiing competition that brings both amateurs and pros alike to the picturesque slopes of Verbier for an ultimate skiing experience. Alongside skiing challenges comes a host of fun activities and socializing events. The Verbier High Five event runs annually and signifies the closing of the winter ski season. Hosted by Chalet Carlsberg since 1999, the event proudly celebrates its 19th year! Read on to learn more about The Verbier High Five and why it is one of the most festive times of the year in Switzerland. The true goal of The Verbier High Five is to have fun and make memories. Part of what makes the event so unique is that anyone has an opportunity to succeed. Both pros and amateur skiers will face off in fun and unusual events. To preserve the quality of the event, only 320 competitors are welcomed each year and spots always go quickly! If you are interested in participating, don’t hesitate to sign up and make travel accommodations as far as possible in advance. Remember to bring a helmet as Carlsberg requires all participants to ski safely. 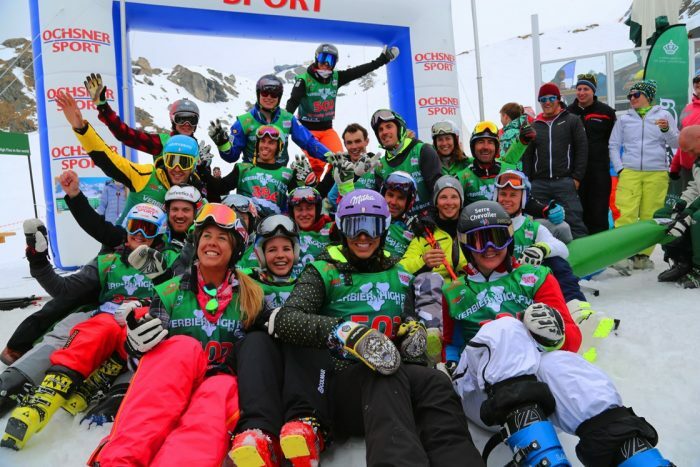 More information regarding the event schedule is available on The Verbier High Five’s website. What types of events will take place? Yearly favorites include Ski Cross, Trampoline, Speed Run Skiing, and the Giant Slalom. The end of the event brings two finalists to go into the ring and match up against pros for a shot at the ultimate victory. You never know who will place where; and it wouldn’t be first time occurrence for a recreational competitor to place ahead of a professional. Go into it and give your all, as everyone appreciates healthy competition. To make each year better than the last, The Verbier High Five is always improving and adding more events for its visitors. The 2017 event will be the first to feature an exclusive ski class of five elite ski clubs made up of French and German speaking Swiss skiers competing to name the top skier of them all. If you weren’t sold on the skiing itself, the fun and shenanigans happening off the slopes will have you calling your travel agent in an instant. Don’t worry about enrolling into the event if it isn’t your style, passer-byers and fans of the fans have just as much fun. The event opens and closes with concerts from internationally recognized names. Ski off of the slopes and on to the dance floor with gorgeous views of the mountains and a fun loving vibe that can’t be put into words. Saturday night’s concert will be the most exciting, so pack everything you might need the morning of to ensure you don’t miss out. After the concert, another DJ comes on to close out the event. Drinking and eating also goes hand in hand with the fun of Verbier High Five. Sip on well-rounded lagers, tasty bubbles, and refined hard alcohol while treating yourself to fall off the bone BBQ from Pub Mont Fort. Best of all? Sitting to your left or right could be one of Alpine’s all time legendary pros. All seasoned pros are friendly and embrace the change of pace and the time to socialize with fans and other skiers. In true Verbier fashion, friendships are contagious, and The Verbier High Five is the perfect starting ground. Event planners and previous attendees recommend coming out a day early and staying a day later than the event to enjoy the festivities that the organizers have planned. Doing so also gives you the best chances of meeting a pro who is also in Verbier for the grand event! The planning committee will be releasing further information on special appearances from particular celebrities as the date comes closer. Whether you plan to challenge yourself to ski with the pros or just want to breathe in the fresh mountain air and celebrate, an enchanting time awaits you at the upcoming Verbier High Five.